A lovely abstract watercolour Jodi! I can solve one of life’s mysteries for you – hamburgers are named after the German town of Hamburg, hence the name and why they don’t have ham in them! OH yes the unanswered questions! Great post my friend! Wonderful! Thanks for a great start to the day! Abstract thoughts to go with some abstract art! I love what you did with those colors, Jodi! And given the March weather we’ve had here, they are absolutely perfect for this month. And seriously, why is there no ham in hamburger? Shouldn’t it be called a beef burger? Now I’m going to be thinking about that whenever I order one! Beautiful abstract! Love your poem of Ambiguity. So true! 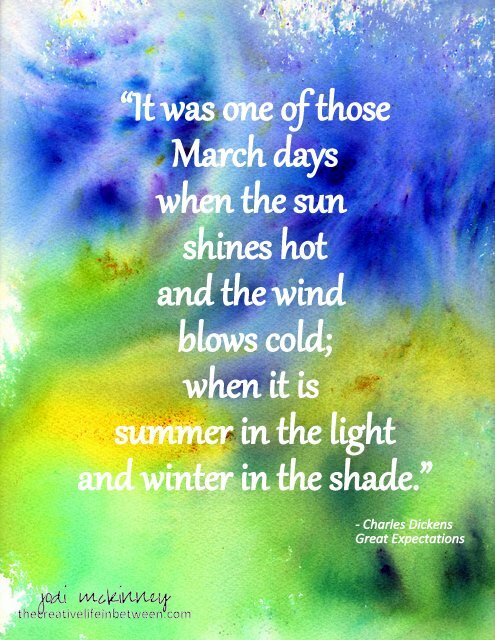 March is ambiguous! We have had wintery weather today and is suppose to last through the weekend. We had 75 degree weather earlier in the week! It was that kind of day here today – so bright and sunny and blue – but only 37 degrees. I’ll take it! I love the sunshine! Oh dear. Sorry to hear about the pain. Hope it is better by now! Sending healing hugs! !